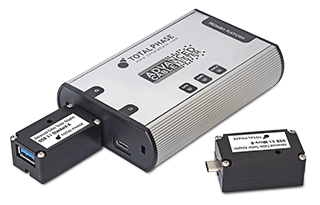 Total Phase is now shipping the eagerly awaited USB Standard-A and USB Micro-B Adapters for the Advanced Cable Tester. You can now test for all aspects of continuity and proper wiring, DC resistance measurement for safe operation/reliability, and E-Marker verification as appropriate. Additionally, you have the ability to test signal integrity on SuperSpeed lines at speeds up to 12.8 Gbps. Testing USB Type-C-to-USB 2.0 and USB 3.1 Standard-A cables, is now at your finger tips. Testing USB 2.0 pairs is supported at 518 Mbps and higher; and any present SuperSpeed pairs can be tested at 5 Gbps and 10 Gbps, with speeds up to 12.8 Gbps supported. This adapter is all you will need for testing USB Type-C-to-USB 2.0 and USB 3.1 Micro-B cables. Testing of USB 2.0 pairs is supported at 518 Mbps and higher; and any present SuperSpeed pairs can be tested at 5 Gbps and 10 Gbps, with speeds up to 12.8 Gbps supported. When used together, these Advanced Cable Tester Adapters allow for testing USB 3.1 Standard-A to USB 3.1 Micro-B cables. Embedded Market Survey - What's your role? We're celebrating 37 years of Komodo Dragon conservation. Do your part to increase the Komodo population! To take advantage of this offer, enter coupon code “Komodo37” during your online checkout. This promotion expires March 31, 2017, so act fast. Coupon only applies to Komodo CAN Solo/Duo Interfaces and CAN accessories. Other limitations apply. I searched high and low for a CAN interface that would meet all of our needs. This is the only one I found with built-in GPIO and, more importantly, D9 headers AND terminal blocks on the same unit (if you run your CAN bus over media other than a D9-terminated cable, this will save you having to build a break-out cable). Finally, its price was also in line with other CAN interfaces that have Linux support. - Their tech support is responsive to questions - same day response so far. - The documentation is good. - The API is good. Comes with example programs, including a loop-back test that allows you to verify the device is working on your system without involving any of your own CAN-based designs. - Dropped into Linux in 20 seconds and just worked.